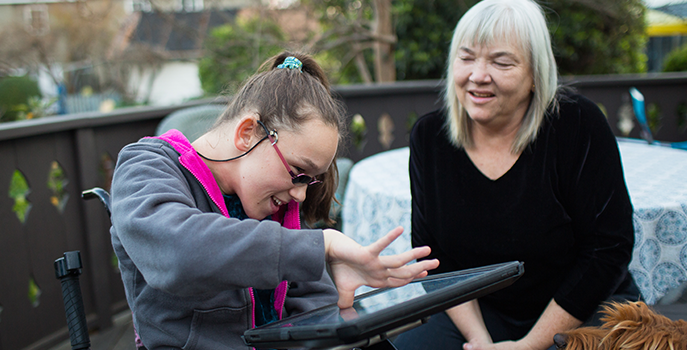 Elina’s AAC journey is really special to us, since in some ways we’ve grown up together. We first featured her in a video when she was just 10 years old, and had already started mastering the Mac app Proloquo. More than a decade later, she’s got a lot going on. We caught up with her over email to ask about her education, what AAC means to her and what’s on the horizon. Elina, we heard that you’re studying now. What subjects are you interested in, and what else do you spend your time on? Yes, I am successfully thriving at Citrus College and after only being there one year, I was eligible to make it into the Honors Program and even made it onto the Dean’s List! I also did all of my Introduction to Theater Arts quizzes and tests entirely on my iPad for the first time (using Keeble) and successfully targeting every single key, independently. I am planning on going into Public Relations/Communications in order to support others with assistive technology. I plan to eventually transfer to a California State University. I’m not sure which one just yet, but I am still planning on majoring in Communications. I currently volunteer for Canine Angels and do a little work for Conductive Education. What kind of AAC and assistive technology do you use in your everyday life? Wrise, Proloquo2Go, Proloquo4Text, and Keeble. I also still use my ‘staple’ Mac laptop, with AssistiveWare’s KeyStrokes and Proloquo with a slow speed joystick and a switch. 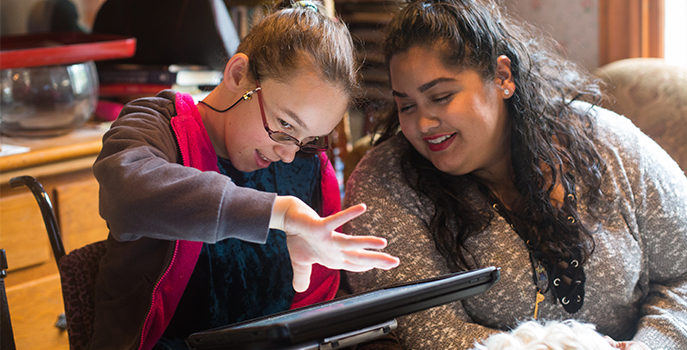 How did you first start using AAC? What was it like for you then? I was in the 2nd Grade Combined Conductive Education/Assistive Technology Classroom when I was first assessed by my teacher, Mrs. Ginny McKee. She was the assistive tech specialist for the whole school district. 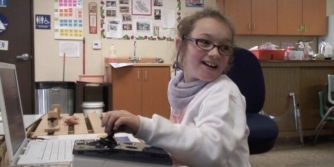 I was very fortunate to be able to try all of the assistive technology she could possibly think of! At the same time, Borbala Goda, my classroom Conductive Ed therapist, worked closely with Mrs. McKee to make sure my plinth desk with a grab bar and slatted stool seating were correct. Their teamwork was essential so that I could even access the equipment properly in the first place. I tried things such as single-switch step scanning, auto scanning, touch screens, various trackballs, a head mouse, and joysticks galore. It took roughly one year to settle in on an assistive technology system that worked easily for me. That system turned out to be a Mac laptop, using AssistiveWare’s KeyStrokes and Proloquo with a slow speed joystick and a switch. Bingo! It all fell into place and I could finally write, speak, and even draw independently! Mrs. McKee found out about AssistiveWare at the CSUN International Assistive Technology Conference for People with Disabilities. Two years later, I was introduced to David when he came out to California to meet and film some of his clients. My 3-minute video, “Me and My Computer” was created when I was 10 years old. I ended the video by saying, “The computer means life to me”. This phrase acquires deeper meaning as I progress throughout life. Ten years later, I hear that professors at some colleges still show my video to their students in order to demonstrate how people with disabilities can communicate and interact meaningfully. I am so lucky to be part of AssistiveWare’s history. They are a fantastic software company that truly cares and are committed to making sure people with disabilities are heard and continually supported! How has your personal tech and app use changed over the years? I began using Proloquo2Go when I got an iPad 2 at the end of 8th Grade. I tried to use it all throughout my high school years, but targeting the icons was very challenging. David showed me some different ways to see if I could possibly step-scan with two switches, and eventually we settled on using the actual iPad as a switch. That worked pretty well, but it still was no piece of cake for me yet. I didn't get my first iPhone 6 Plus until just before I started college about a year ago. Oddly enough, it was much easier for me to target the icons on a smaller device, but my involuntary muscle movement still had a tough time. I just recently purchased an iPad Pro and I am extremely happy with it. I can now access nearly everything on my iPad Pro because of its very large size and I can organize Proloquo2Go and Proloquo4Text in a way that works smoothly! I added Keeble before the iPad Pro, and I still use it with every single app. I am getting to the point now where I only use my iPad Pro at school. What was your first impression of our apps? I remember other people with disabilities using Proloquo2Go at my high school and I was totally impressed! 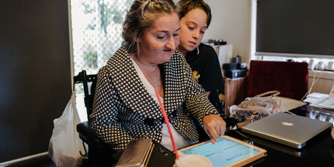 I am always tinkering with AAC, so immediately I thought that these AssistiveWare apps were so cool and that they could help a lot of people. I don’t remember exactly my first impression of Proloquo2Go and Proloquo4Text because I think learning both apps was integrated seamlessly into my school curriculum and previous AssistiveWare software since elementary school. In other words, I can honestly say it was a natural process for me to go from one AssistiveWare app to the next one. By the time I got to college, with all the different ways I access AAC, everything fell right into place. How do you use AAC in your life now? I like using a combination of both Proloquo2Go and Proloquo4Text. I like how Proloquo2Go has a grid section with pictures and also a typing section where people can just use the Keeble keyboard. I like how I can turn the grid section in Proloquo2Go into automatic-scanning or step-scanning with only having to use the iPad/iPhone screen as a switch. I like how AssistiveWare made Keeble primarily for those of us who have print disabilities and targeting issues. Keeble has to be my favorite and most frequently-used app on my iPad! I like how I can use Pictello to have stories already programed onto my iPad to tell people about stuff I talk about often. My first Pictello story was about my art when I won the CVS/VSA All Kids Can Create Award along with a trip to Washington, D. C., where I went with my parents, Canine Angel service dog, Zoe and my assistive technology teacher, Mrs. Ginny McKee. When my best friend, Emily, passed away unexpectedly this past summer, I made another Pictello story. Not only explaining what a great friend she was to me, but also how she kept me and so many other kids going through the Conductive Education program. From the time we started pre-school, all the way through to the after-school program and even now, though we’re in college, so we can be successful in all aspects of life. Can you describe the other programs you’re using now? Basically, I still access my computer the same way I did over ten years ago. (Have I been an AssistiveWare customer for that long already?) I, of course, have to adapt to updated modifications developers make to Assistive Technology (good or not so great), but I know I need to grow with Assistive Technology as time goes on. My on-screen keyboards, of course, have evolved over the years as my writing becomes more and more advanced. When I first started using KeyStrokes with the Block Keyboard, I would have the word prediction and the letter keys read out loud to me, plus the letter keys would be highlighted as I went over them with my cursor. As time went on and I needed a more efficient way of typing for more advanced assignments, I learned how to use the Improved Chubon Plus Keyboard along with the word prediction. For both keyboards, I have always liked the Show Typing in Keyboard option because it’s just simply easier for me to see what I’m writing both on a document and on my keyboard. Wrise software is lovingly used for all my homework and assigned articles that I have to annotate, and I appreciate having the audio in it to listen to what I have written. My mom even uses Wrise to do her own work because it’s also helpful for her to have documents read aloud to see if she made any grammar mistakes. What voice do you use? Why did you choose this one in particular? My voices are progressing as I get older. I used Nelly in elementary school, and it is featured in my AssistiveWare video. From there, I gradually added more adult voices and in high school, I used Rosa in Spanish class. Right now, for Proloquo2Go and Proloquo4Text, I use Heather. It’s a woman like me, an adult voice that can be easily understood by others in my classroom and outside community. I used all kinds of voices in my Honors Speech class. I have lots of stories in my head that have characters with intriguing voices, and these need to be told with voices that match their personality. For Wrise on my laptop, I use Alex to read my text books out loud, and for feedback on my essays. Alex sounds like my English professor, and his voice helps me discover typos, missing commas, and other common English mistakes. Hearing Alex’s voice also helps if I need to restructure my paragraphs, as they don’t always make sense because they are out of order. I have also downloaded the Spanish voice of Rosa for when I have to fulfill my college Spanish/Foreign Language requirement. 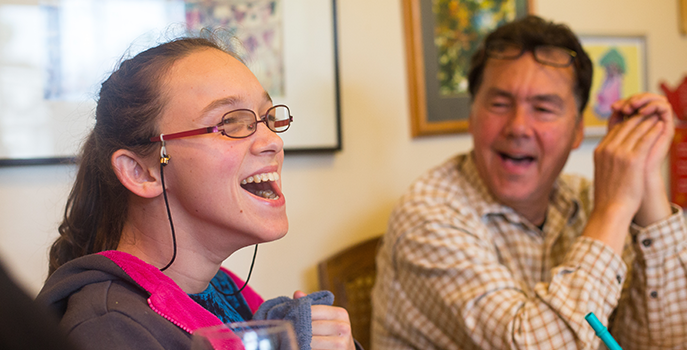 What would you tell someone who isn’t using a communication aide, but might be considering one? Communication devices can make all the difference in the world! Speech is the hardest part of my disability, so assistive technology has been the greatest way I can express myself. It will certainly take a while for someone to learn how to use a communication app, so they will have to be EXTREMELY PATIENT! When I first started using AAC, I would only use the keyboard with word prediction because I was too lazy to search through the dozens of pages to find the already pre-programed phrase I wanted to say. It simply takes time to master which phrases are on what pages, but you will eventually get it. What would you say to parents who are just starting the AAC journey with their child? Like the person who is actually using the AAC device, the parent must also be EXTREMELY PATIENT! If a child is learning how to use Proloquo2Go or Proloquo4Text on an iPad, I highly suggest that the parent use the same app on their own iPhone or iPad. Mom and I did this when we got our first Macbook’s, since we didn't have iPhone's or iPad’s back then. Mrs. McKee insisted that mom get her own computer so she wouldn't have to take my computer away to learn the system in order to help me. Modeling is the key! How does your disability affect your communication? Speech is the hardest part of my disability. When I was little, my first form of communicating was through very basic sign language. When I got to Danbury, though, they knew my speech could be clear enough to decipher, so I had tons of speech therapy. I still remember my signs, and they are like a natural instinct to me. It may seem like a surprise to many people that every other part of my body is much easier to control than my mouth muscles. If people are around me often enough, they can understand that I move my mouth differently in order to make my sounds clear. Communication apps definitely relieve a lot of anxiety for me! When people see me using technology, then they really see who I am. If one actually thinks about it, there are all different kinds of ways of communicating these days! As a fully dedicated customer, I am proud to grow with the AssistiveWare Company and learn how to use their new software as I need it more and more as I get older. Thank you AssistiveWare Team, for making a gigantic difference in my life through assistive technology!